Matthew Konrad Tippel is an accomplished vocalist, pianist, conductor, and director residing in Indianapolis. He has been music director and conductor for over 25 musicals including most recently ANNIE & Hairspray at Booth Tarkington Civic Theatre and Bridges of Madison County at Footlite Musicals. He has received 13 Encore Award nominations for his vocal and musicals direction and took home awards for his vocal and music direction for The Spitfire Grill: The Musical, The Brain from Planet X, Carrie: The Musical & Hairspray. He has also conducted many major choral works such as Dan Forrest’s’ Requiem for the Living, John Rutter’s Magnificat, Theodore Dubois Seven Last Words of Christ and G.F. Handel’s The Messiah just to name a few. 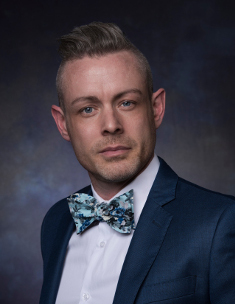 Matthew is a 1998 graduate of Butler University with a BA in music and begin his graduate studies in choral conducting in 2019. By day Matthew is director of choral activities and General Music at Brebeuf Jesuit Preparatory School and director of music at Allisonville Christian Church.